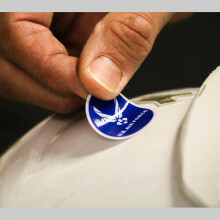 During the NFL’s Salute to Service campaign, the NFL encourages every NFL player to salute our nation’s military and veterans by displaying a special helmet decal. These military branch decals are a small gesture to show the immense gratitude of the NFL community for all those that dared to take the oath. Everyone who joins the military has one thing in common, they must swear-in by repeating the enlisted or officer Oath. The Oath of enlistment is something that every service member must promise and adhere to for his/her entire military career. The Oath ceremony may be administered to a single applicant or a group. Friends and family members are invited to watch. And in some cases, thousands of NFL fans. 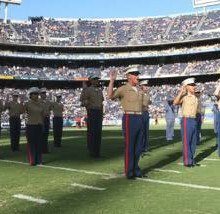 Throughout the Salute to Service campaign each November, many NFL teams work with local military to host enlistment ceremonies and re-enlistment ceremonies on-field during pre-game or halftime festivities. There are several stories detailing the origins of the challenge coin. One of the most popular starts in WWI when an American lieutenant gave bronze medallions to his fellow pilots as mementos of their service together. One pilot kept his “coin” with him at all times. When this pilot was shot down behind enemy lines, he was made to forfeit his personal belongings. But he did not forfeit his coin. The pilot escaped and, after a time, was picked up by a French patrol on the lookout for German saboteurs. Without identification, the pilot was assumed to be a saboteur. The French prepared to execute him. Desperate, the pilot showed his coin. One of the Frenchmen recognized the insignia and delayed the execution until the pilot’s identity was confirmed. After the pilot was reunited with his squadron, its leader made it a tradition for all members to carry their coins at all times. Gradually, this practice spread to other military units…and eventually to non-military organizations. 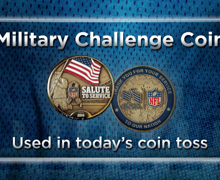 During Salute to Service, the NFL uses military challenge coins during the coin flip prior to NFL games. Originally written by Francis Scott Key in 1814, the National Anthem’s wartime roots are unmistakable – but it took over 100 years for “The Star-Spangled Banner” to become a part of the game day ritual. 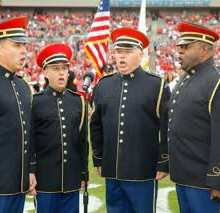 History records various sporting events in which “The Star-Spangled Banner” was played dating from the mid-1800s. But it wasn’t until the first game of the World Series in 1918 that the anthem and sporting event game day tradition began. The U.S had entered into World War I 17 months earlier and the public mood at home was sullen and anxious. The government began drafting major league baseball players for military service. During the seventh inning stretch of Game 1 of the World Series, the military band on hand struck the first notes of “The Star-Spangled Banner” and Red Sox third baseman Fred Thomas, who was playing in the Series while on furlough from the Navy, immediately faced the flag and snapped to attention with a military salute. The other players on the field followed suit, in “civilian” fashion (stood and put their right hands over their hearts). The crowd, already standing, joined in a spontaneous sing-along. When the Series moved to Boston for Game 4, the Red Sox followed the Cubs’ lead, but moved the playing of the Anthem to the pregame festivities. Over the next decade, all professional leagues adopted the singing of “The Star-Spangled Banner” grew into the game day tradition we know today. During the rendition of the “Star Spangled Banner,” it was customary for civilians and non-uniformed military to salute the flag with their right hand placed over their heart, while active and retired military rendered a hand salute. However, the National Defense Authorization Act of 2008 contained an amendment to allow military to render the hand salute when not in uniform. Today, all active and retired military should feel empowered to salute the flag during the anthem to show their pride for their service to our country. For nearly 5,000 years flags have been used to identify military units, signal movements, and rally the troops. As armies became trained and adopted set formations, each regiment’s ability to keep its formation was potentially critical to both the regiment’s and the army’s success. In the chaos of battle soldiers needed to be able to determine where their regiment was. Flags and banners have been used by many armies in battle to serve this purpose. Due to the advent of modern weapons, and subsequent changes in tactics, Colors are no longer used in battle, but continue to be carried by Color Guards at events of formal character. The color guard traditionally consists of enlisted members and is commanded by the senior (color) Sergeant, who carries the National Color and gives the necessary commands for movements and rendering honors during drill exercises, parade ceremonies, or presentation at sport events. Being assigned to the color guard is considered an honor due to the fact that these individuals present and carry the symbols of their unit and country. Depending on the circumstance and subject to the orders of their commander, members may wear full dress or less formal uniforms. 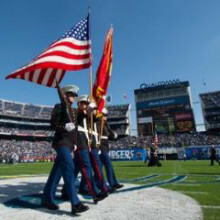 Military Color Guards consider it an honor to present the symbols of their unit and country at NFL games across America every weekend.